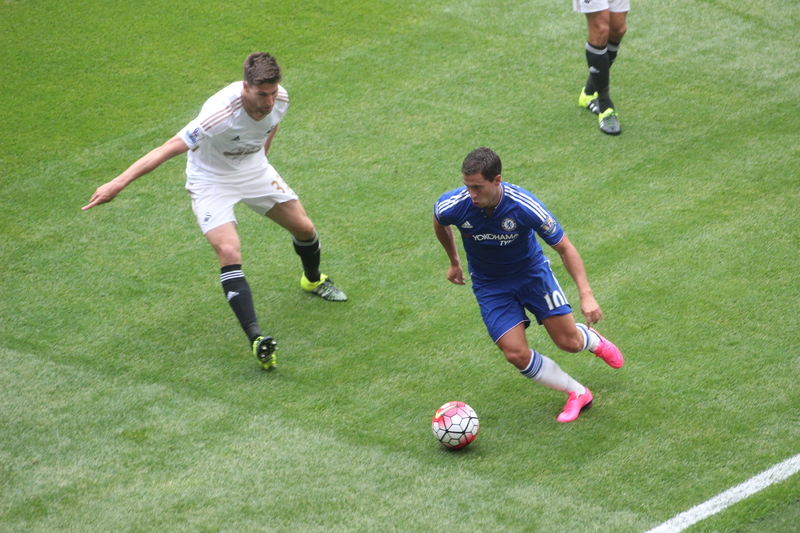 Chelsea vs. Swansea City : 8 August 2015. The same four Chelsea supporters that had battled the awful traffic for last season’s league opener at Burnley were back together, twelve months later, for the first league game of 2015/2016. I was joined on my trip to London, the home of the champions, by three good friends; Glenn, PD and Lord Parky. And although the early evening game against Swansea City would be my sixth Chelsea match of the season, there was no doubt that all of the other encounters, to various degrees, were much less important than this one. Slowed by some traffic around Swindon, I sped away and made good time. Although we had been chatting away like mad at the start, by the time we had reached Reading, the conversations had dwindled. As I pulled out of the M4 services, almost apologetically – everyone knows how much I dislike discussing upcoming games ad nauseam – I suggested that it was appropriate that we ran through our projected line-up for the game ahead. Glenn agreed. Parky and PD stuck to their ciders. We passed the town of Slough, where my local team Frome Town were opening up their league campaign of 2015/2016. It was a full on day of football. After calling in at The Goose, with the beer garden sun kissed and overflowing but with fellow supporters being rather guarded about how well they thought Chelsea would fare this season, Glenn and I popped down to The Malt House. By that time, John – an acquaintance visiting from Los Angeles – had joined us. He has been living in London since March working on the score of the latest of the Mission Impossible series of movies. I wondered if our defence of the league championship might be similarly-named. Some friends in The Goose might have agreed with that working title. As for myself, I was relatively confident in our chances, though expected Manchester United to press us harder than any. I felt that Arsenal would flatter to deceive – that lovely football phrase – while I had doubts about Manchester City’s team spirit. Above all, we have Mourinho. He may irritate me at times with his outbursts, but lest we forget that he is one of the very best coaches in world football. For a change, we left enough time to calmly reach Stamford Bridge before the crush. The news had filtered through about the team. It was the same team that I had named earlier. Inside, I was saddened to see a large wedge of empty seats in the Shed Upper. They were obviously some of the 3,000 away tickets which Swansea City had not managed to sell. This is disappointing. It meant that around five hundred tickets were left unsold. As the teams entered the stadium, I spotted a large and Italian-style banner, being held aloft by the inhabitants of the first few rows of the Shed Upper. Sadly, the two pensioners in our row – Joe and Tom – were not present. We wondered if they would be well enough to attend many more matches at all. As the game began under a perfect London sky, the atmosphere was bubbling. There was cut and thrust in equal measure from both teams in a lively start. The hulk of Bafetimbi Gomis rose to meet a corner, but his header thankfully passed the post. As he was defending the part of the Stamford Bridge pitch closest to my seat, I could not help but notice that the first four times that Branislav Ivanovic was involved in the game, he either miss-controlled, lost his marker or missed a tackle. After a far from impressive start, I felt I had to keep an eye on Brana throughout the game. Usually so reliable, his form has worried me thus far this season. I’ll give him the benefit of time, though. We looked impressive as we attacked the Shed End, with fine movement and intricate passing. Oscar again looked in fine form. A lovely Swansea move, involving the strongly-booed Shelvey, found Gomis and a magnificently-timed tackle from John Terry saved our skins. Courtois then saved well from Ki Sung-Yueng. This was evidently a good game of football. The crowd were so obviously paying great attention to every twist and turn, in a way that was so missing from the previous couple of games. A chance for Diego Costa, and a tumble inside the box, but no penalty. Soon after, a foul on Dave resulted in a Chelsea free-kick. Oscar punched a low cross in to the heart of the Swansea box, and the ball appeared to go unaided in to the far post. Alan and I had our first “THTCAUN / COMLD” moment of the nascent season. However, on the half-hour mark, Swansea attacked our goal once more and after a fine Courtois block from that man Gomis, it was the nimble-footed debutant Ayew who managed to slide the ball in from the resulting melee. Just as the Welsh hordes were celebrating with hymns and arias, we worked the ball out to Willian on the left. His attempted cross was wickedly deflected up by Fernandez and over the flat-footed and stranded former Goon Fabianski. The hymns and arias stopped. The Chelsea roar took over. It had been a fine half of football. Despite Swansea’s resolute play, Chelsea had done just enough at the break to go in ahead. As Paul Canoville – after New York, Charlotte and DC, there is no escaping him – walked the Stamford Bridge pitch at half-time, I dipped in to the match programme in search of entertainment. Two statistical nuggets to share. Anyway, twenty-three games and only three defeats, the last two at Coventry City in 1997 and 1998. Also listed were the six highest attendances for overseas friendlies. Games in Baltimore, DC, Jakarta, California, Sydney were listed, but top of the pile was the game in 2011 that I was privileged to attend in Kuala Lumpur. Other than that, nothing much has changed in the design of the programme from last season and the season before that and the season before that. Maybe, like the megastore – which I had neither time nor inclination to visit – it needs a major overhaul. I’ve always fancied myself as our programme editor. Swansea came out guns-a-blazing in the second period. They peppered Thibaut’s goal with several efforts. Then, a ball from Shelvey released Gomis, who had beaten an offside trap and found himself free. As he approached the edge of the penalty box, Courtois swung a leg and Gomis tumbled. Admittedly, I was not particularly well sighted, being around one hundred yards away, but not only did it look a penalty, I was not surprised to see a red card being brandished. Asmir Begovic replaced the unfortunate Oscar, who had impressed thus far. Gomis coolly rolled the ball in from the penalty spot. Chelsea pressed on. At times the urgency was breathless, though not always with the required degree of skill to accompany it. Willian attacked down the right. Hazard, the little darling, attacked down the left. Without an extra man, though, we found it difficult to work the ball in to the brooding menace of Diego Costa. We urged the team on. Brana headed over. At the other end, a Gomis goal was adjudged to be offside. Begovic saved well again. The ball was worked well to the dancing Eden Hazard, but his angled shot was parried away. Despite Mourinho ringing the changes in the final quarter with King Kurt replacing a listless Fabregas and Radamel Falcao replacing the ever-willing Willian, in truth our best chances had come and gone. An errant foul by Williams on Costa drew howls of derision from others, but no penalty decision from Michael Oliver. I had noted that Costa had gone down too easily on other occasions throughout the half. Maybe that had worked against him. In the circumstances, although I was obviously disappointed that our title defence had not opened up with three points, it is obvious that we did well to scramble a draw against a highly proficient Swansea City team, especially as we were reduced to ten players so early in the second-half. There won’t be many better teams than Swansea City who visit us in SW6 this season. On the drive home, I stopped at Reading Services to refuel car and body. I briefly checked in on what the Chelsea Nation thought about the evening’s game via my smartphone. Although some were calm and pragmatic, others were sensationalist – “we drew against Swansea, therefore we will struggle this season” – and tiresome – “this player was rubbish, that player was rubbish” – in equal measure. For those among us who get pre-menstrual about a draw against a fine team such as Swansea City, I have to wonder if they are really suited to the life of a Chelsea supporter. In that long list of opening day results, there is a line which details a 0-0 draw at Stoke City in August 2011. I seem to remember that season ending rather well. Next Sunday, we travel to the city of Manchester for an early-season heavyweight bout with one of our title contenders. This entry was posted in Season 2015-2016 and tagged 2015-2016, Branislav Ivanovic, Paul Canoville, Summer Tour, USA by Chris Axon. Bookmark the permalink.